Oceanview Publishing announces the forthcoming release of What’s Next…For You? 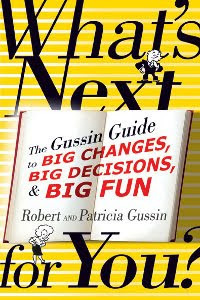 The Gussin Guide to Big Decisions, Big Changes, and Big Fun by Robert and Patricia Gussin. What’s Next…For You? will be available wherever fine books are sold on February 1, 2010. What’s Next…For You? (Oceanview Publishing, ISBN: 978‐1‐933515‐73‐1, Non-Fiction, $13.50) is the incredible story of Robert and Patricia Gussin, two “retirees” who watched with glee as long, successful careers in science and medicine gave way to writing, publishing, and winemaking. Much more than a memoir, and anything but a how-to-start-a-business guide, What’s Next…For You? is a remarkable been-there, done-that tale about taking chances and finding opportunity in even the most inopportune moments. Through the engaging, first-person, he said/she said narrative, Robert and Patricia Gussin deliver an inspirational guide filled with advice on why it’s never too late to reinvent yourself, and why doing what you love (and loving what you do) is always within reach. What’s Next…For You? 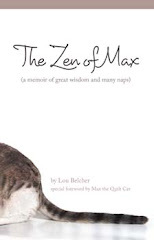 also includes insights on keeping priorities in check, facing change head-on as you move along life’s path, and how even the small changes can have a big impact. A must-read tale of joyfully switching gears, changing careers, and overcoming “paralysis by analysis,” What’s Next…For You? is a clear, easy-to-understand guide to reinventing yourself from real experts—two people who did it themselves and lived to tell the glorious tale. Whether you’re waiting for the “right moment,” feel you’re stuck in the wrong job, or guilty of procrastinating on a big decision, What’s Next…For You? provides the answer to that all-too-common question of how to get from where you are to where you want to be. Board-certified in Family Medicine, Patricia Gussin practiced medicine and has directed medical research in her role as worldwide vice president for a leading healthcare company. She is the author of Shadow of Death, which was nominated for “Best First Novel” in the Thriller Awards, sponsored by the International Thriller Writers, Twisted Justice, and The Test. A native of Pittsburgh, Robert Gussin retired from Johnson & Johnson as Corporate Vice President of Science & Technology and Chief Scientific Officer in 2000. He is the author of Trash Talk. Robert and Patricia Gussin divide their time between Longboat Key, Florida, East Hampton, New York, and their vineyards in New Zealand.